PACK 4: EDICIÓN PASTELERIA = CONTÉ LLIBRE "REPOSTERIA Y PASTELERIA I" (PEPER I DIGITAL) + LLIBRE "REPOSTERIA Y PASTELERIA II" (PEPER I DIGITAL) + TAPETE DE SILICONA + CAIXA DE MÀNEGUES PASTISSERES + CAIXA DE 26 BOQUILLES PER LES MÀNEGUES + RODET PER ESTIRAR LES MASSES. 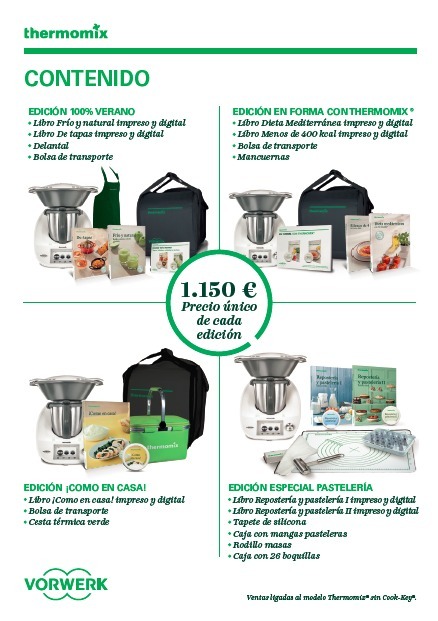 ARA EL POTS TENIR UN DELS PACKS PER NOMÉS 50€, AMB LA COMPRA DEL TM-5 (POTS PAGAR AL COMPTAT O FINANÇAT)NOMÉS TENS DUES SETMANES !!! QUINA ESCULLS?